The word on the street is that this Japanese combo is the Far East answer to King Crimson, circa Red. Although occasional Frippisms abound in the guitar parts, I think they more closely resemble a Cuneiform outfit at times. Even so, the title track bears a slight resemblance to early Crimson (a la "Epitaph"). 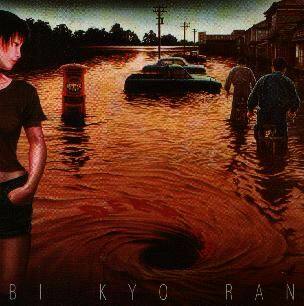 In all, Bi Kyo Ran is an instrumentally promising outfit that could benefit a lot from increased emotion and variety. The opening sequence, "Psycho, Parts II and III," is a bit too mechanical and academic for my tastes, with its pounding rhythmic motifs and repetitive melodies. In its favor, the album does pick up after a while, and the aforementioned "Deep" and epic-length "21st Century Africa" do pack a certain wallop. Bi Kyo Ran obviously work best on stage, and their precision and energy come through more on this album than on previous studio efforts. The Frippian guitar leads are the most impressive aspect of this band, though guitarist Kunio Suma (who writes the majority of the material) rarely reaches that climactic peak that is one of Robert Fripp's trademarks (recall "Starless" — nothing beats that). In all, Bi Kyo Ran plays a humorless, academic variation on the mid-70s Crimson sound, with artsy Cuneiformesque dissonance providing the rhythmic base. Not bad on its own merits, but don't expect to hear the mighty Crimson on this disc.